give your guests photos with their favorite professional athletes and sports trophies! Check out our 30 second video with the New England Patriots Cheerleaders on the field with 7,000 people. Check out our 30 second video with the Boston Celtics as we print trophy photos on site. 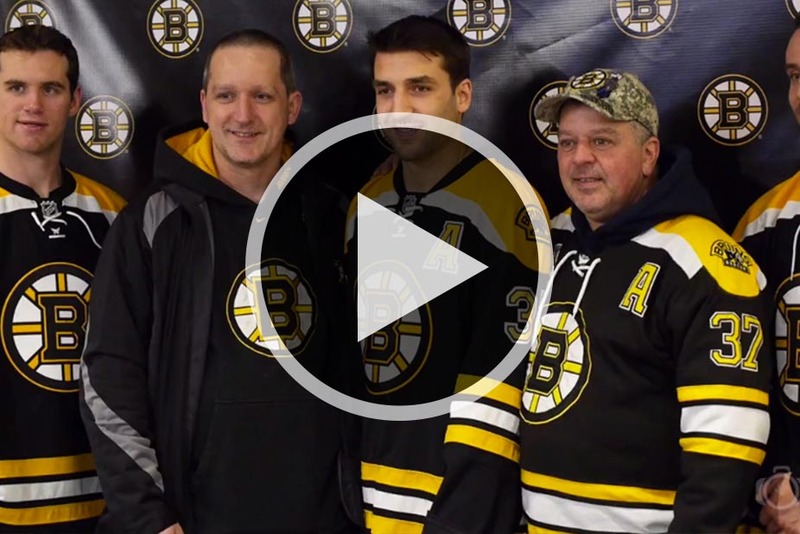 Check out our 30 second video with the Boston Bruins and 6,000 fans with our social media-shared photos on-site. Photos In A Minute has worked with some of the top sports franchises and organizations to entertain their guests. Every photo we print and share is branded with your corporate sponsor logo and company message. Whether we are capturing photos with our Green Screen system or our Step & Repeat option, we attach a pre-programmed text message to every branded photo, all delivered to your guests mobile device in seconds! We can upload images to Facebook and Twitter with a custom hashtag specific to your event. We can also collect email addresses from your guests for future marketing campaigns. We can deploy 5, 50, 100 or more photo printing stations at any venue. Having multiple photo upload stations is perfect for small or large scale events from VIP parties, trade shows, to retail mall locations and more. We can also design custom photo frames and print them prior to your event. This makes for a great keepsake, as well as an additional opportunity to promote your brand! We support one of the fastest ways to share photo or video with a branded text message to your guest. Our text-to-phone feature broadcasts the branded photo with a message sent to guests' phones in seconds. No wifi or cell connection is required on-site. Select from dozens of the top social networks and share through the Photos In A Minute cloud network. You tell us where you want your consumer images to end up, and we’ll make it happen with a customized brand message to follow! We provide a variety of on-site data collection services to collect lead information and survey responses. We can customize our method to match your desired on-site experience, the volume expected, and what information needs to be collected. We’ve created a quick and simple method for taking pro headshots. We will come to your location and have ‘picture day.’ It only takes a minute per person. Your team will love their high-quality portraits and your customers will appreciate the consistent and professional images. Add more interest to your event with moving media! Live video and GIF capturing are automated with the Photos In A Minute self-serve Photo Booth kiosk. A variety of Photo Booth designs are available to match your branding and on-site usage. We are able to email branded photos to your guests in seconds. As you collect emails, guests automatically receive a beautiful, mobile-friendly, customized email with a branded photo attached.